I have two new favorite Charlotte hot spots for this summer season, and luckily for me, I also have had the honor of working with both of them through Southern Belle in Training! 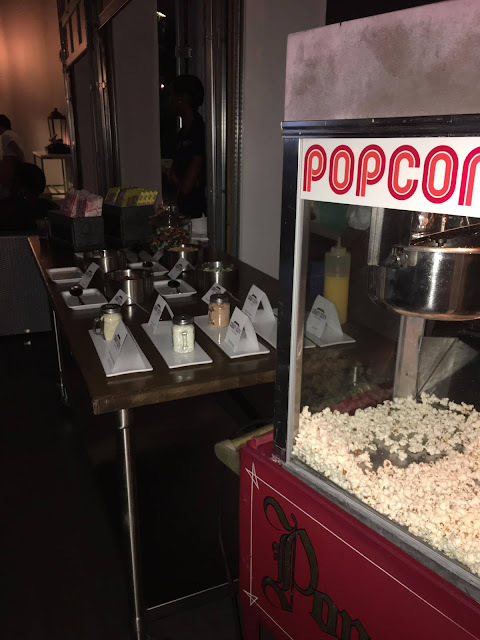 Le Meridien and the Sheraton Charlotte are two neighboring hotels in Uptown Charlotte, and this summer each of the hotels opened up a fun new venue to both hotel guests and the general public. Le Meridien launched City Lights, a modern new rooftop bar concept for Charlotte, and the Sheraton launched Craft City Social, Uptown's first public pool and day club! Some of you might remember that I attended the grand opening festivities for both of these venues earlier in the summer. Last weekend, I was thrilled to be invited to Craft City Social to attend their first DIVE IN movie night event of the summer! A little bit more about Craft City Social: the highlight of the venue is the brand new pool and beautiful cabanas surrounding it, which have a nice view of Uptown behind it! The bar and day club portion of Craft City opens beautifully to the pool as everything is open air. Inside there is a large bar, many comfortable couches and chairs that make the perfect hang-out space, and even some fun games like foosball! 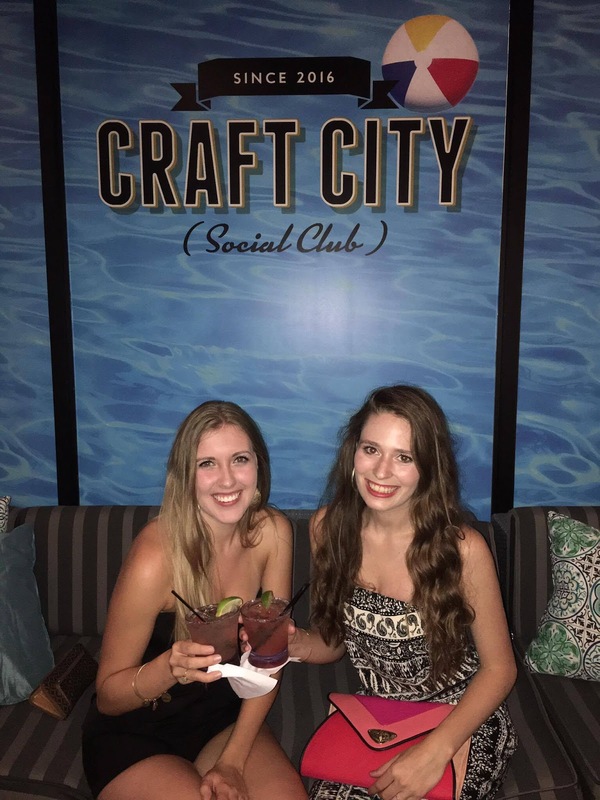 While Craft City is known more as a day club due to the pool, they are open well into the evenings as well, and continue serving there food and drink menus. DIVE IN movie nights are a chance to cozy up on beach chairs or in the cabanas and to watch a movie under the stars! It's essentially a drive-in movie experience, but at a swanky pool club and in the heart of the city. For the inaugural summer of DIVE IN nights, Craft City has chosen to air retro and/or musical movies. The movie that was selected for the first event was Grease. Surprisingly I had actually never seen this classic film, so I was very excited to finally get to see the tale of Sandy and Danny played out on the big screen! Caroline and I enjoyed some delicious strawberry basil margaritas on the house from Craft City, and then settled in to enjoy the movie! The weather began to get questionable right before it was supposed to begin, so the DIVE IN movie night was moved inside near the bar. But this ended up working to our advantage I think, as we got to relax on the comfiest of couches, and we ended up being closer to the gourmet popcorn bar that was set up for guests to enjoy (and complimentary!). Sorry that my iPhone picture quality isn't the best, but this just shows you a little taste of all of the incredible popcorn toppings that were offered! I enjoyed hot pepper flakes and parmesan cheese on my popcorn and it was delicious. Caroline and I had a wonderful time watching Grease at the first DIVE IN movie night, and as always I can't wait for more fun memories to be made at Craft City Social! For all of you who are in the Charlotte area and interested in visiting Craft City, now is the time to do so because they are launching a special contest! One of Craft City's signature trademarks are their large and bright yellow rubber ducks that float around in the pool. In honor of a few of the rubber ducks that went missing in recent weeks, Craft City Social Club is hosting a Dirty Dozen Ducks contest! They have created 12 special ducks (which have been decorated by local artists), and these ducks are waiting to be "adopted" by Craft City guests. Craft City Social Club is encouraging those who take a special duck home to post 10 Instagram photos with their duck in various locations (tagging @craftcitysocialclub and #whattheduckclt in each post), and at the conclusion of the contest each duck owner will be entered in a contest to win three nights' lodging at Starwood Hotel properties (which own the Sheraton Hotel that Craft City is located in). How fun is this?! P.S. Happy public access opening of the Nordstrom sale today! Check out my favorite picks in Wednesday's post, or in the widget on the top of my blog's homepage! Craft City Social Club provided me and my guest with free admission to their event. All opinions are honest and my own. Thank-you for supporting the brands that support Southern Belle in Training! The DIVE IN movie night seems like so much fun -- Grease is the perfect summer movie to play! Glad you could enjoy it with your suite mate! This is such a cute event. It looks like you and Caroline had a wonderful time. I would love a rooftop pool/bar/outdoor movie venue in Seattle! These both sound like great places to go! I love the idea of the Dive In! I wish we had a place like this in SA but we don't. I think it would be such a fun and hopping thing if it were in my city. You look like you had such a great time, I love that jump suit! What aa fun night!! I love that! This sounds like an amazing time! Glad you had a blast. Those strawberry basil margaritas sounds delicious! This looks so fun!! What an amazing night! PS can we just talk about how fabulous you look in your jumpsuit?!? LOVE that outfit! This place looks like so much fun we should have a girls night out there! What an awesome GNO! :) Have a great weekend. What a fun event!! I wish I was able to attend the event, looked like a fun time! That seems like such a fun event, and so awesome! It looks like you had a great time. I still need to go there with you! Looks SO fun!